a cosmic ray detector in the background. 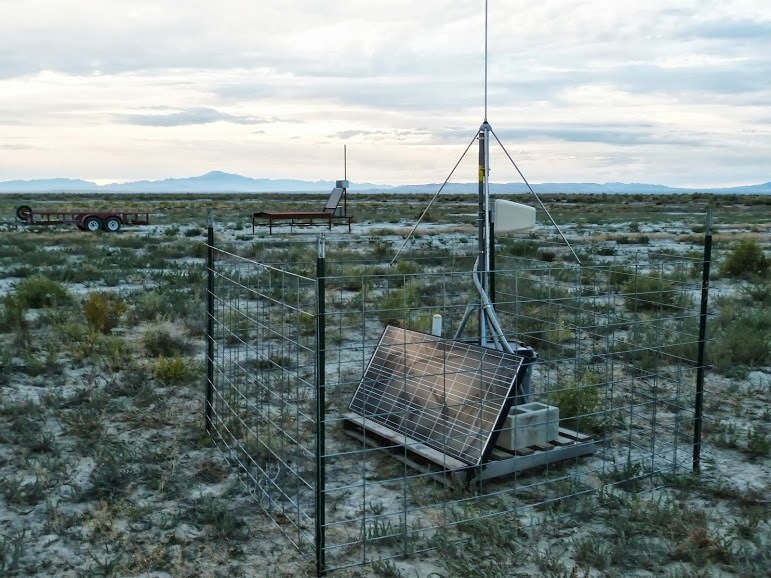 Panorama of the lightning detector at the left and cosmic ray detector in the middle. Credit: William Hanlon, University of Utah. cosmic rays are typically high energy particles that arrive at angles indicating sources outside the solar system. Auroras are caused by the variable stream of solar mass ejection colloquially called solar wind, but solar plasma would be a more accurate description. Both of these phenomenon are similar in they connect planet Earth to a much larger electric current potential than could be achieved through convection in the troposphere alone. Attempting to corolate a lightning strike to a cosmic ray event is like corolating the ejection of a bullet from the muzzle of a gun to the tension on the spring of the hammer. Only by examining the quiet double layers built up in the stratosphere and the ionosphere above the clouds where the anvil meets can we understand lightning and its close cousin the charged sheath vortex aka tornado. Don't forget big sister hurricane and grand cosmic diety Gamma Ray Burst. great comment Peter. I have thought along similar lines. Maybe we could compare notes. Well said indeed Pete! And it seems like he has been over to TBP. This presentation already happened, anyone have their conclusions? I enjoyed Dr. U-Yen's speech very much, along with Ben Davidson, it has become a great discussion. It is apparent to me why so many cultures throughout the history of mankind worshiped the sun along with the stars and planets. They affect our delicate condition much more than is currently believed by most. Both talks are free to watch on Youtube. Interesting comments and relevant to the discussion! The problem that we are studying is restricted to lightning associated to storm clouds at lower altitudes. They that produce lightning at reasonably lower altitudes. Storm clouds charge because of convection current. If you measure the electric field within storm clouds it is much less than required for a spontaneous discharge, so something else must trigger the discharge. Of course it is a bit of a simplistic view because there are electrical current within clouds. Now, the cosmic rays we are interested are the high energy ones that produce particle showers at altitudes of 10 km or less, much lower than the ionosphere. These can potentially help initiate discharge as it momentarily ionizes air and molecules within storm clouds. The second problem that we are studying is where high energy gamma rays are produced when the discharge happens. We observed a good correlation between gamma ray bursts (detected by the telescope array) and lightning data from the national lightning detection network (NLDN). The correlation is both in time and position, with an precision of about 500 m, but lightning strikes are much larger than that. Although we see correlation we still don't know when and where within lightning this emission happens as lightning can propagate for several kilometers. So maybe later this year we will have more data. The question of sprites, jets and elves as raised in one of the comments is also relevant to the discussion. The difference would be that this type of lightning closes the circuit to the ionosphere, instead of to the ground. It would be very interesting to study these but we will start with the more common forms of lightning first. As Spock would say, this entire subject is Fascinating.